As the Jacksonville University team shook hands with the judges of the CFA Institute Research Challenge, Jamie Seim saw a little something in their eyes. 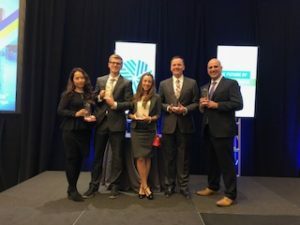 Seim and his team members, Henry Crayton and Maria “M.J.” Fueyo, had just finished their dynamic presentation in March at the Americas Regional of the annual worldwide competition in Boston. The judges are supposed to be straight-faced, Seim said, and they were. But, he saw a little glimmer in their eyes. “Maybe I was hoping to see it there,” he laughed. Right afterward, the students from the other schools were extremely complimentary of JU’s presentation on the Harris Corporation, a Florida-based leading defense contractor and technology company. The Research Challenge calls for students to develop a recommendation on whether to buy, sell or hold their assigned stock. JU’s team – which made the final presentation of the day – initiated a buy recommendation, based on several factors, including Harris Corporation’s strong financial metrics and spending roughly twice as much on research and development as its competitors. About 30 minutes later, the judges announced JU had won the Americas Regional and would be one of five teams in the world to compete in the Global Final on April 27 in Kuala Lumpur, Malaysia. The victory serves as another building block in JU’s quest to be viewed among the elite. The Davis College of Business already has the prestigious designation of being accredited by the Association to Advance Collegiate Schools of Business, but there are other aspirations. The school already has earned the respect of the business community for the quality of its curriculum and graduates, said Steve Kelley, vice president of community development lending and investing at EverBank. “Some of our brightest folks in the areas I work in have a background from JU,” said Kelley, who himself is a Dolphin. He will graduate this month with a Doctor of Business Administration after completing a program he said is bolstered by the AACSB designation and the quality of the faculty. The JU Research Challenge team had certainly put in the work necessary to win. 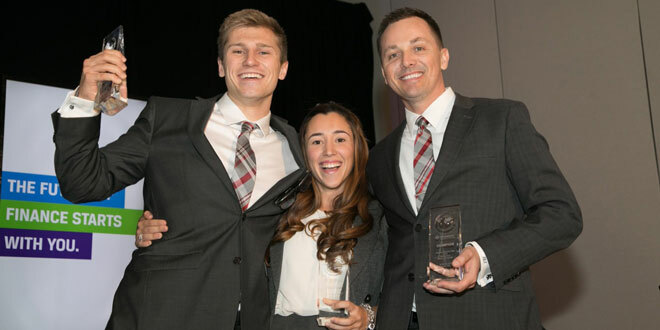 They spent countless long nights and weekends researching Harris Corporation and perfecting their presentation, all while juggling already-busy schedules of personal and professional obligations. “Honestly, I don’t know how I’m doing it. … I’ve been deprived of sleep for three or four months, but I would do it all over again,” said Fueyo, a member of JU’s women’s golf team who will graduate this month with an undergraduate degree with a double major in finance and economics. The team benefitted from what members saw as the crucial experience of a Shark Tank-like panel organized by President Tim Cost, where top area business leaders put the team through its paces. He said the group was impressed by the students’ compelling spark of creativity and innovation. The quality of the presentation was comparable to what would be offered at firms such as Goldman Sachs, said Cost, who has a master’s degree in finance and was a senior leader at several Fortune 100 companies before becoming president of his alma mater in 2013. The team’s coach, Professor Abdel Missa, has been telling Crayton, Fueyo and Seim for months they can win the entire competition. Missa and Dr. Daphne Wang, a fellow finance professor at the Davis College of Business, worked together to select the team. They chose students from the Dolphin Student Investment Fund, for which they are faculty advisors. Crayton said he wanted to take advantage of all the opportunities available to him at JU. In addition, a couple of members from last year’s JU team that won the Florida competition talked to him about their experience. “They sold me on it being a good opportunity,” he said. For Fueyo, it puts into practice a lot of things she has learned, but on a different level. Missa said Seim was the natural choice to be the team’s captain. Seim is a portfolio manager of the student investment fund and works for Wells Fargo Advisors. The three didn’t really know one another, other than being part of the student investment fund. But in addition to being intelligent, the trio shares a key trait: They’re athletes with the drive to win. Crayton plays soccer, while Seim and Fueyo are golfers. They also believe their differences and their diversity are important. “Abdel is originally from Morocco, Dr. Wang is from Taiwan, Henry is from New Zealand, M.J. is from Argentina, and I’m just a farm kid from Nebraska,” said Seim, who will graduate in April with an Executive MBA degree. Together, they are a winning formula. Each of the 16 Florida schools were given Harris Corporation’s stock, which the state winner would continue with throughout its time in the challenge. The teams shared just one hour with Harris, which made a presentation to the group as a whole. Research Challenge rules dictate that was the only contact teams could have with the company. But, the JU team went to work inside and outside the university to learn about the company’s suppliers, customers and peers. They went beyond what’s in the assignment to find out how the company works in the real world, Cost said. For example, Valeria Gonzalez-Kerr, a brigadier general who is director of strategic initiatives at JU, helped set up several meetings for the team. The students visited local military bases and talked to people who used products made by the company, which the team determined dominates the communications systems field. And they talked to a soldier who said his life was saved on a battlefield in Mosul, Iraq, because he was using one of Harris Corporation’s radios. Seim said the radio connects to a drone, which provides live aerial footage. Because of that live footage, the troops – which Seim said were about to turn a corner and blindly walk into an area where the enemy was – were able to avoid the danger. “Victory goes to the one who finds the unique point of view, not just what’s on page 36 in an earnings report,” Cost said. The JU team also benefitted from the questioning and feedback of the business experts Cost assembled. Rules prevented any of the experts being from the investment field. “It was a super-intense 40 minutes of questions,” said Crayton, who will graduate in April with an MBA. He specifically remembered a strong line of questioning from a member of the group who asked about immigration and the labor force. Fueyo said the event was extremely helpful in preparing the team for the Americas Regional. “It gave us an idea of what we had to work on for Boston,” she said. The team has also benefitted from Missa and Wang’s leadership, expertise and guidance. Dr. Robert Boylan said Missa and Wang are excellent partners who complement one another. “Abdel is the showman, but the trains run on time because of Daphne,” said Boylan, the department chair of accounting, finance and economics. Cost said instead of Missa putting his award from Boston in his office, he asked where it would best benefit the university. That glass award is on display in Cost’s office, where many students regularly visit. Even if JU doesn’t win the world title, the team’s performance already is a victory for the school in terms of strengthening its reputation and ability to recruit top students. The CFA Institute is a world-renowned organization of Chartered Financial Analysts. 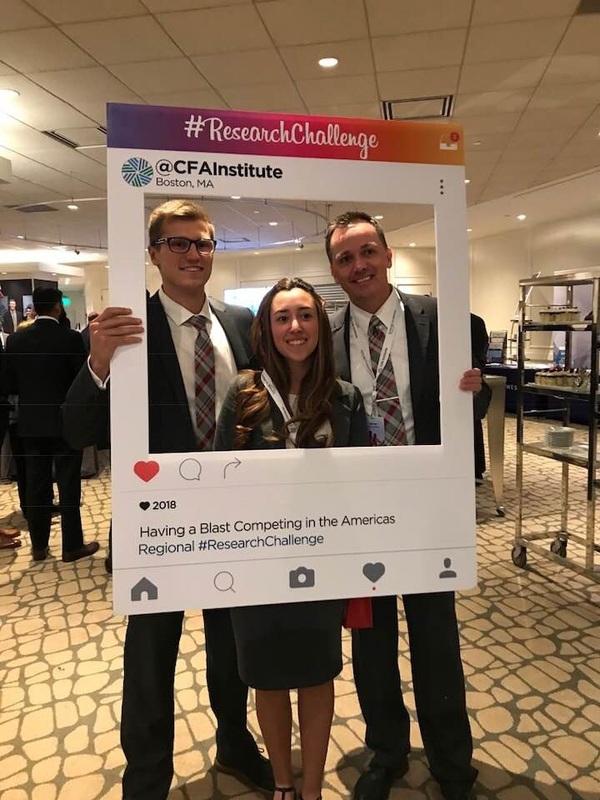 The institute’s Research Challenge is a preeminent competition for finance students, Capener said. “We’ve positioned ourselves to say, ‘here’s evidence of why we are a really great program,’” he added. Kelley, of EverBank, agreed that the team’s showing in the highly regarded Research Challenge is illustrative of the school’s quality. “To win state again this year is incredible in its own right. To win at the Americas Regional – I can’t even say it without getting a little silly about it because of how amazing it is,” he said. “We were up against the best of the best. We took all comers and came out on top,” he said. Kelley said when he shared the news of JU’s Americas Regional victory on social media, he used the hashtag #marchmadnessinfinance. “That’s really what it is,” he said. The team’s performance in the Research Challenge also contributed to North Avenue Capital’s decision to hire Fueyo after she graduates. Ben Chatraw, the company’s chief executive, said the firm looks for candidates who can process CFA-level content and apply that skill set to underwriting and analysis. Chatraw said he hopes the team’s success in the Research Challenge will attract additional talent and resources to JU’s business program. Capener said reaching the goal of being a top five business school in Florida will take growing the number of programs the Davis College of Business offers and attracting more students. Instead of having 20-25 students graduating each year in accounting and finance, he said the school wants 40-50 graduates so it can have a larger impact on the talent pool available. A confident Missa believes the success in the Research Challenge will be a good start. “This is just the beginning, honestly. There is no reason why we can’t build the best finance program in the world here. Give me one reason why not,” he said. For now, though, the attention is on winning in Malaysia. Missa said competing in front of an international audience automatically requires some adjustments to the presentation. Plus, he said, the design can be improved, as can the question-and-answer portion. He has a game plan, which he didn’t want to share. “We don’t want the other teams to find out,” he said. The university is competing against one other American team (University of Minnesota Duluth), as well as two from Europe and one from Asia. Seim believes the JU team is destined to win. “Everything seems to be aligning. The stars are aligning for us,” he said. The team works well together, each sharing responsibilities in its opening and closing statements and while answering each question from the judges. And they’re always conscious about how much time is on the clock. As time was running short in Boston, Fueyo made what Seim called an “amazing adjustment” in her ending remarks to allow Crayton time to close the presentation. Crayton said he didn’t get to use his favorite closing because there was only 40 seconds left and he needs about a minute. But he hopes he can use it in Malaysia.